As the dust from Black Friday settles, a clear trend has emerged: retail businesses that focused their sales efforts on mobile users were greatly rewarded. According to Newsweek, mobile shopping accounted for over a third of all online shopping, up 6 percent from last year. The article also revealed that apps from retail giants like Amazon, PayPal and Apple have helped boost mobile sales by streamlining the checkout process. While the development of consumer-facing mobile applications is becoming the norm for companies striving to attract more costumers, there is another opportunity to grow revenue via app development that has been slowly gaining steam. That is, businesses are developing custom employee-facing mobile applications to drive productivity and streamline internal operations. A 2014 survey from Apperian shows that 53 percent of IT leaders have already begun development of internal apps to address business processes—from communications to remote access to simple administrative tasks. Stay focused on what you’re trying to accomplish. Mobile apps are meant to be lean and straightforward. Trying to do too many things with one app can clutter the design and have a negative impact on your workforce. If there are multiple components of your organization that could benefit from a customized app, design multiple applications with each core group or action in mind. What is the functional purpose of the employee-facing mobile application? Having determined the business objectives that you are trying to accomplish, the next question you must ask is how the application will accomplish that objective. To answer this question, it is important to locate your organization’s weak spots. For instance, if your goal is better time management, and you see that employees are bogged down by overloaded inboxes, consider an app with a chat-room feature for real-time communication. There are two big factors that come into play when determining your organization’s readiness to embrace an internal mobile app. The first is whether you have the IT personnel necessary to ensure that the app is built correctly and can be maintained securely. This can be determined based on the core competencies of your IT staff, the number of personnel on your team, and the amount of training required for them to develop and maintain your app. The second factor is to determine which employees require mobile access for their job function and how long will it take to train them to use the new application. 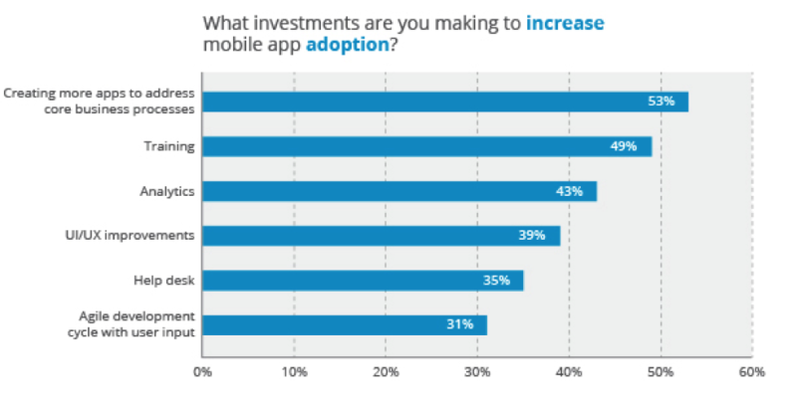 While the implementation of an internal mobile app can lead to increased revenue through streamlining of processes, the return on investment is not immediate. In considering your budget, be sure to prioritize your goals for the app so that if you are forced to choose one function over another in the short term, you can choose one that will have a broader effect on your organization’s success. Be sure to include in your budget the potential cost you can incur for additional internal support to monitor the app, and the time it will take for your employees to be trained properly on how to use it. You should also consider using an already existing app that might satisfy the company requirements, this will generally be a cheaper option but the trade-off is that your organization will have to adapt to the nuances/workflow of the app you decide to use. There are also licensing and subscription costs that should be taken into account and measured in the long term in order to do a fair comparison to the larger initial cost of developing an application from scratch. Once you have answered these four critical questions, your organization will be able to properly initiate development of an internal mobile app.